The Bitcoin phenomenon continues to grab the attention of investors, and now precious metal enthusiasts. A variety of private mints have taken note and started offering precious metal rounds for those fans of the popular cryptocurrency. You cant hold actual Bitcoin in your hand, but you can invest in a beautiful, commemorative rendition of the design. Right now, 1 oz Colorized Proof Bitcoin Guardian Commemorative Silver Rounds are available to purchase online from JM Bullion. Arrives inside of a protective plastic capsule with Certificate of Authenticity! 3rd silver option in the Bitcoin Guardian release! Limited mintage of only 1000 rounds! Obverse includes the famous Bitcoin symbol. Reverse features the profile of the Guardian. Each of the 1 oz Colorized Proof Bitcoin Guardian Commemorative Silver Rounds released here today ship in a protective plastic capsule to ensure the beautiful finish and current condition for years to come. The rounds arrive with a numbered Certificate of Authenticity that bears a matching serial number to that found on the edge of the round. The Proof Bitcoin Guardian Commemorative Silver Round offered through this JM Bullion exclusive is a colorized product. It bears all the visual hallmarks of popular proof silver rounds, with contrasting fields of deeply-mirrored, clear elements and strong, frosted matte finishes. Adding to the brilliance of these rounds though, youll find a colorized finish. It ads dark background colorization to the obverse field, and encircles the Bitcoin symbol and highlights the symbol itself in a golden hue. 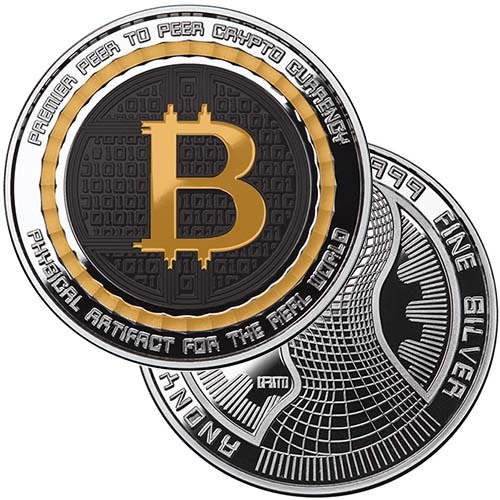 On the obverse of the 1 oz Colorized Proof Bitcoin Guardian Commemorative Silver Round youll find the Bitcoin symbol, a capital letter B with two vertical lines struck through it. Engravings include Premier Peer to Peer Crypto Currency on the top rocker with Physical Artifact for the Real World on the bottom rocker. The background field reflects digital coding indicative of the virtual existence of Bitcoin. 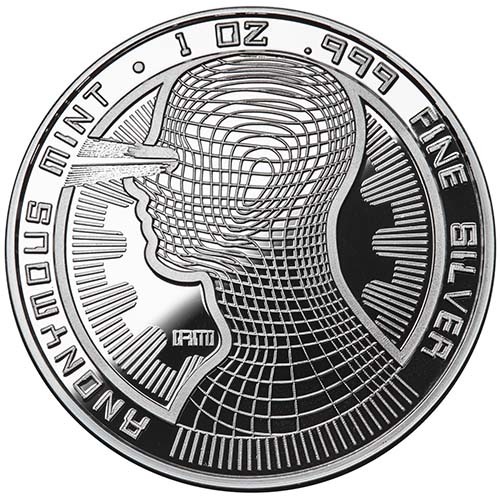 The reverse of the Bitcoin Guardian Commemorative Silver Rounds bears a left-profile portrait of a male figure. Known as a Guardian, he emits beams of light from his eyes and is considered an all-seeing individual who spends his time watching over everyones rights to privacy and anonymity online. Anonymous Mint releases the Bitcoin Guardian Commemorative Rounds as its first popular series of silver rounds in this genre. Designed by Julie Lindquist, the Bitcoin Guardians are an exclusive release through JM Bullion. If you have any questions, please contact JM Bullion. Our customer service associates are available at 800-276-6508, online using our live chat service, and via our email address.
" BITCOIN and SILVER all in one WHAT? I love this product." "BITCOIN and SILVER all in one WHAT? I love this product."